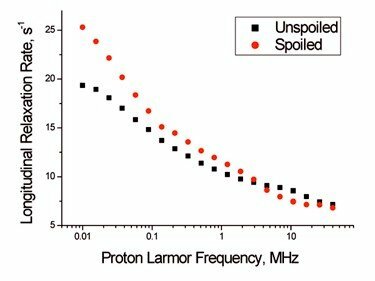 FFC NMR relaxometry is a non-destructive low-field magnetic resonance technique which is performed in the range of a few kHz up to around 100 MHz, depending on the instrument (unlike FT-NMR spectroscopy which tends to work with magnetic field strengths from 200 MHz upwards). The information obtained is connected to the molecular dynamics of a substance or complex material through the measurement of the nuclear spin-lattice constant 1/T1 over a large range of magnetic field strengths, which is carried out on the same instrument (relaxometer). The technique is particularly useful in revealing information on slow molecular dynamics which can only be carried out at very low magnetic field strengths. 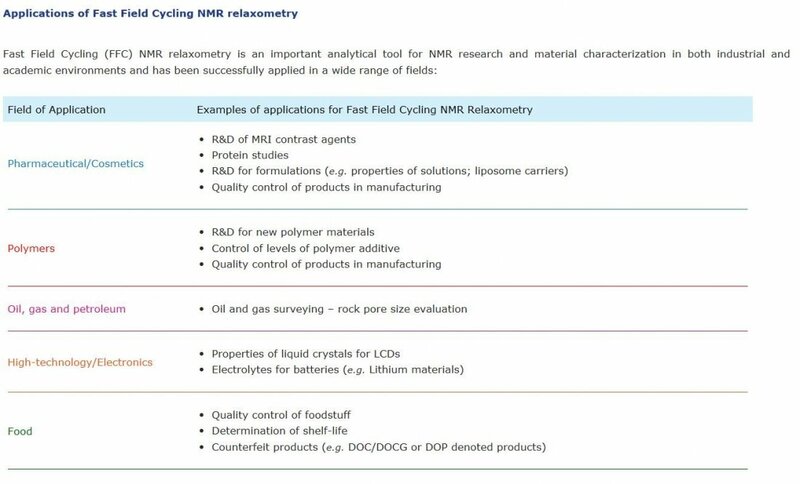 For a more detailed explanation see Fast Field Cycling NMR relaxometry (section below) and Relation of NMRD to molecular dynamics. Exploration of relaxation of interesting nuclei, such as 2H, 13C, 7Li, 19F, 23Na, etc. : structural information connected to the presence of a particular nucleus at a specific molecular site may be obtained. Combining a 3 Tesla cryogen-free superconducting magnet with either SPINMASTER or SMARtracer™ allows extension of the magnetic field strength range for the acquisition of NMRD profiles to the range of the latest high field clinical MRI scanner. The combined systems are ideal for studying relaxivity of MRI contrast agents. 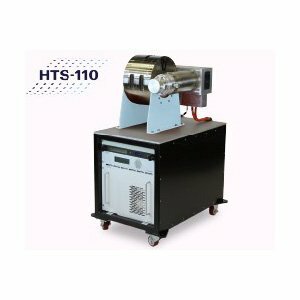 The system has been developed in collaboration with HTS-110, the leading company in the design of high temperature superconducting magnetic solutions. The magnetic field dependence of 1/T1 of any given substance or material is shown in the graphical form as a Nuclear Magnetic Resonance Dispersion (NMRD) profile. The NMRD shown below shows the different profiles of a foodstuff before (black squares, unspoiled) and after it has expired (red dots, spoiled). Changes in the relaxation rate, 1/T1, of a substance or material, are sometimes not evident at single magnetic field strengths, but when studied over a wide range of magnetic field strengths, as with FFC NMR relaxometry, changes are easier to identify as they are often more visible with the NMRD profile, especially at the lower magnetic field strengths. Thus, the Nuclear Magnetic Resonance Dispersion (known as NMRD or MRD) maps the Larmor frequency dependence of the spectral density function that is related directly, by the Fourier transform, to the time correlation function characterizing molecular motions. Any motion that causes changes in the local fields contributes to the relaxation process including rotation, translation and chemical exchange among different chemical or physical environments. A critical feature of NMRD is that it is possible to map spectral densities as low as 5-10 kHz which corresponds to a time regime in the vicinity of 30 microseconds, i.e., well into the range of chemical exchange events. Variations of the method permit exploration to lower frequencies. Fast Field Cycling (FFC) Nuclear Magnetic Resonance (NMR) relaxometry is a measurement of the nuclear spin-lattice relaxation rate constant as a function of the applied magnetic field strength that provides a unique characterization of the local molecular dynamics of molecules over a wide frequency range. The spin-lattice-relaxation-rate constant (1/T1) characterizes the time dependence of the approach to thermal equilibrium for the nuclear spin magnetization if it is perturbed from equilibrium in a magnetic field. The process involves an exchange of energy between the nuclear spin energy and the other degrees of freedom in the system collectively called the lattice, even in a liquid. This energy exchange requires photons of energy corresponding to transitions between the nuclear spin energy levels that are a linear function of the magnetic field strength. The fluctuations that cause the coupling derive from molecular motions in the system ranging from vibrations at the highest frequencies to global fluctuations at the lowest frequencies. Varying the magnetic field strength varies the frequencies sampled by the relaxation rate measurement. By varying the magnetic field over wide ranges, it is possible to map the power spectrum of the fluctuations from a few kHz to hundreds of MHz corresponding to a time scale range from tens of microseconds to hundreds of ps. Incorporation of a paramagnet in the system permits exploration of dynamics to the sub picoseconds domain. One may think of nuclear magnetic relaxation dispersion (NMRD) as the magnetic analog of dielectric dispersion; however, NMRD has the distinct advantage that one generally has no difficulty identifying the origin of the motions that drives spin relaxation. The solid curve is a “fit” to the data assuming a single rotational unit (monomer). The fit fails because the solution is severely aggregated. 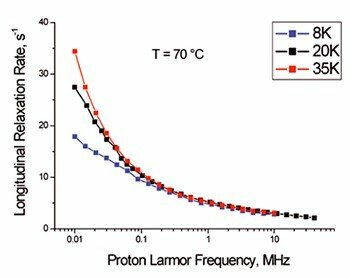 As a consequence of the aggregation, the inflection point is shifted a decade to lower Larmor frequencies corresponding to much larger rotational units than a monomer, and the dispersion is broadened which reports through the rotational correlation times the distribution of apparent molecular sizes. The weighting of the contributions to the NMRD profile is proportional to the rotational correlation time, thus, the larger aggregates make a much larger contribution to the relaxation rate constant than the smaller ones. The relaxation dispersion profiles for cross-linked bovine serum albumin samples at different compositions shown in semilogarithmic (a) and log-log (b) presentations. The dispersion is predominantly a power law in the Larmor frequency for the rotationally immobilized protein cases or very large aggregates. A FFC relaxometer, such as the Stelar Spinmaster or SMARtracer, is a specialized system with a low field magnet (0.25, 0.5 or 1 Tesla) which is able to electronically switch the magnetic field strength required, from a few kHz up to the maximum magnetic field strength allowed by the magnet (up to 42 MHz 1 H Larmor frequency with the 1 Tesla magnet) and which is able to overcome the limits of the NMR signal-to-noise ratio at low magnetic field strengths. A standard fixed field magnet measures the relaxation rate constant 1/T 1 with the limitation that it is unable to change the magnetic field strength of operation and thus is only able to measure 1/T 1 at a single magnetic field strength. Fixed field time domain instruments generally operate in the range of 2 – 60 MHz. The FFC relaxometer is able to measure 1/T 1 at very low magnetic field strengths (down to a few kHz) which is of particular advantage as many molecular processes occurring in the range between nano-seconds and milli-seconds (slow molecular dynamics) are very difficult to measure at higher magnetic field strengths. The NMRD profiles below, measured with a Stelar FFC NMR relaxometer, show three different weight distributions of polyethylene glycol (PEG) melts (blue squares 8,000 Da, black squares 20,000 Da, red squares 35,000 Da). This demonstrates how the ability to measure nuclear spin relaxation over a wide range of magnetic field strengths, and especially at very low magnetic fields, can be of advantage. 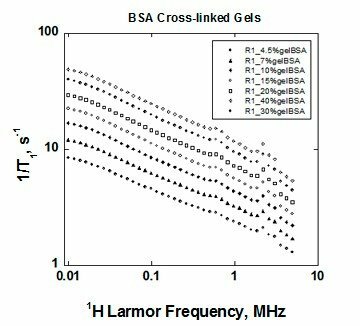 It would be difficult to distinguish between these three different polymers at magnetic field strengths higher than 0.1 MHz. Data produced from in-house studies at Stelar. Samples kindly provided by Dr. M. Fleury, IFPEN, Paris. The measurement of the field dependence characterizes the rotational correlation time, τ, as well as the strength of the coupling, B 2 , driving relaxation. However, one does not need to know B 2 to extract the dynamical information because it derives from the Larmor frequency dependence entirely. 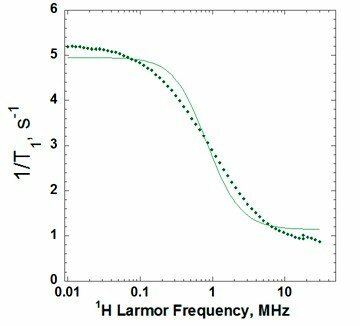 In the fixed field experiment, the Larmor frequency, ω, is fixed. In this case, to extract τ, one needs to know B 2 accurately. Further, there is no test of the assumptions in the theory for the fixed field measurement, but in the NMRD experiment, if the theory is inappropriate, it will not faithfully fit the NMRD profile. How does the FFC experiment work? FFC NMR relaxometry is a non destructive method requiring a small amount of a solid or liquid sample (enough to fill a standard 10mm NMR tube to a volume of around 1cm 3 ) with no other form of preparation required. The Stelar wide bore magnet is able to accommodate larger samples such as rock cores or even small animals. 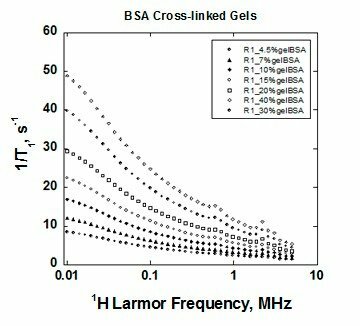 In the first instance, a high magnetic field, B pol (polarization field), is applied to pre-polarize the sample in order to boost signal intensity. 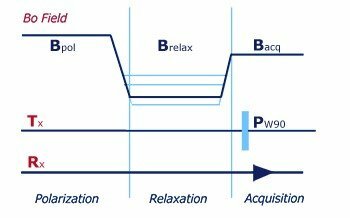 The sample is then allowed to relax in a second field, B relax (relaxation field), which can be set to any desired value, including zero. Finally, the field is set to the detection field, B acq (acquisition field), for signal acquisition. All Stelar relaxometers come with a specialized software which will guide the user through the FFC experiment and calculate the necessary running time.